Details: In 2000, the separations of 13 separate CSO basins were designed to the 95% stage. The CSO areas represented basins whose full separation would be cost effective compared to other CSO abatement technologies. The remaining basins where the full separation had not been constructed were CSO Areas 022 and 045. 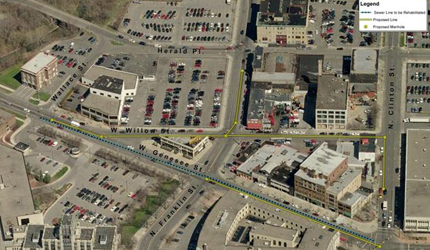 CSO Area 022 is located in downtown Syracuse and the tributary sewers are located in North Franklin, West Genesee and Willow Streets. 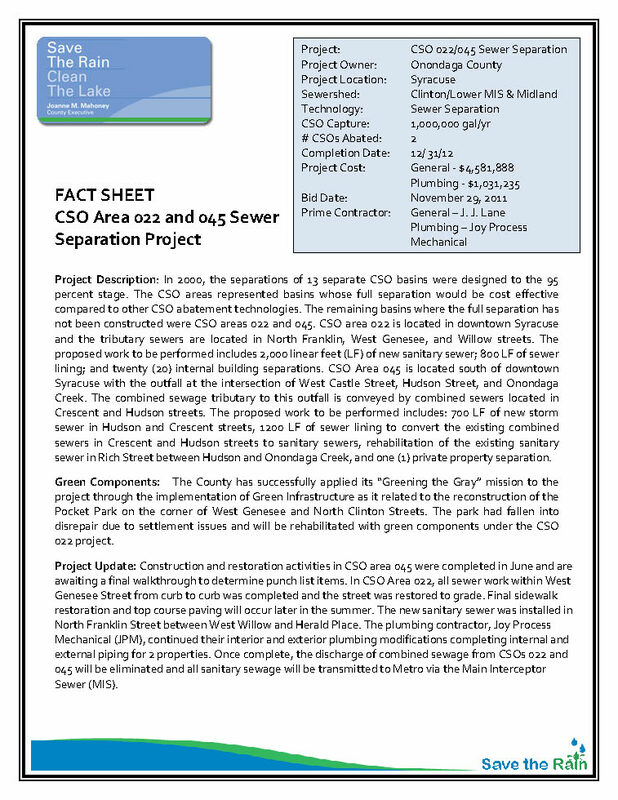 CSO Area 045 is located south of downtown Syracuse with the outfall at the intersection of West Castle Street, Hudson Street and Onondaga Creek. The combined sewage tributary to this outfall was conveyed by combined sewers located in Crescent and Hudson Streets. 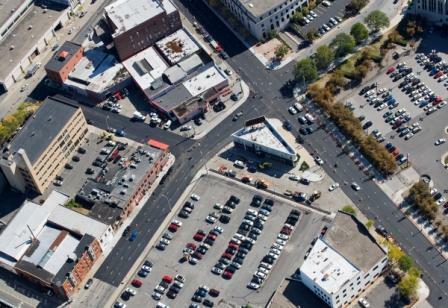 The separation work performed included: new storm sewer in Hudson and Crescent Streets, sewer lining to convert the existing combined sewers in Crescent and Hudson Streets to sanitary sewers and rehabilitation of the existing sanitary sewer in Rich Street between Hudson and Onondaga Creek; and one private property separation. Greening the Gray: The County has successfully applied its “Greening the Gray” mission to the project through the implementation of Green Infrastructure as it related to the reconstruction of the Pocket Park on the corner of West Genesee and North Clinton Streets. The park had fallen into disrepair due to settlement issues and has now been rehabilitated with green components under the CSO 022 project. Project Update: A final walkthrough for the CSO Area 022 portion of the project was completed in April and a work list was created. In addition the monitoring to verify the internal building separation performed throughout the project was completed in April. During the course of the verification process two connections were determined to be deficient and taken out of service until repairs could be made. The repairs were completed in June and re-verification will be performed in July. In addition the contractor completed the remaining sidewalk installation work near Darwin’s and began to perform the items on the work list. The closeout process is continuing on both contracts for the CSO 022/045 Sewer Separation Project.